The Metro Blue Line Slauson Station. Segment A has concluded the Environmental Clearance and Preliminary Engineering phase and is entering the Final Design/Engineering and Construction phases. Segment B of the project is referred to as “Rail to River,” because it connects the Metro Blue Line east to the Los Angeles River. In March 2017, Metro concluded the Alternatives Analysis (AA) for Segment B. As part of the AA, Metro studied four alternatives for continuing the active transportation corridor from Segment A at the Metro Blue Line Slauson Station to the Los Angeles River. The alternatives studied included Malabar, Utility Corridor, Slauson Avenue and Randolph Street (See map below). With community and stakeholder input, the Metro Board of Directors approved the Randolph Street Alternative as the Locally Preferred Alternative (LPA). 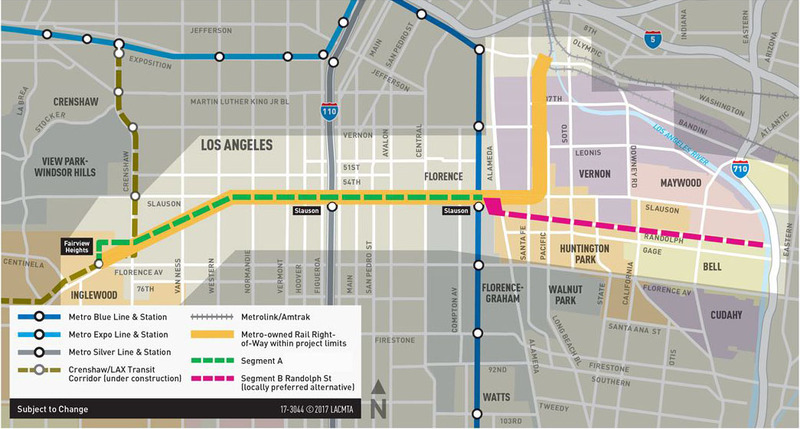 With Randolph Street as the LPA, Segment B will span 4.3 miles in length, continuing from the east-end of Segment A at the Metro Blue Line to the Los Angeles River. Segment B is entering the Environmental Clearance and Preliminary Engineering phase. Segment A is funded by a combination of federal, state and local funding sources. In October 2015, the Project became the first of its kind to be awarded funding from the Federal Transportation Authority (FTA) in the form of Department of Transportation (DOT) TIGER Grant. Additional funding was provided by a Caltrans ATP Grant and Metro. The AA work for Segment B is funded by Metro local funds. View the Project Area map PDF/printable version .